“Prominence on today’s Sun” by flickr.com user Paul Stewart licensed by CC0 1.0. Paul Stewart’s solar image from this past February displays prominences (on the edge of the solar disc) and filaments (dark threads on the surface) on the Sun. 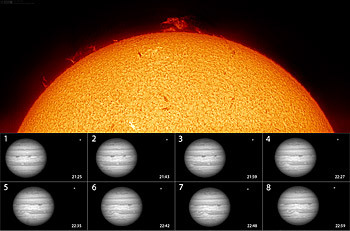 It is a 3-photo mosaic made with a 2.5x Powermate through a dedicated solar telescope. The image was published in a recent issue of Amateur Astrophotography Ezine. Flickr user “s58y” posted thirteen images of Jupiter made with a 2x Powermate. Taken over a three hour period, it show a wealth of bands, zones, white ovals, the Great Red Spot (transiting between images 8 & 9) and even the major moon Ganymede. 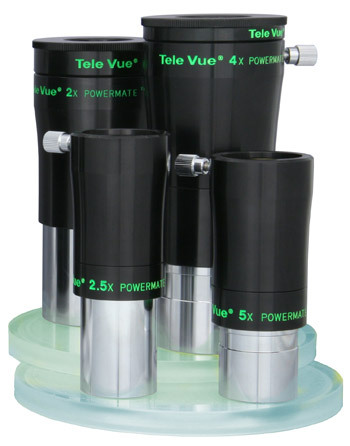 Tele Vue Powermates are available in 2″ barrels (2x & 4x) and 1¼” barrels (2.5x & 5x). 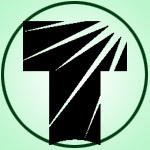 They all accept the Tele Vue T-Ring Adapter (separate models for 2″ & 1¼”). See website link below for details. Powermates work with all scopes and you’ll see many models of refractors, Newtonians, and SCTs represented in the gallery. Most any commonly available DSLR, astro-camera, and even some industrial cameras will work with Powermates. Cameras just need a slip-in 1¼” or 2” nosepiece or T-Ring (using an optional Powermate T-Ring adapter) to attach to the Powermate. This makes a Powermate or two (they can be stacked with no adverse impact) a great item for any astro-imager’s equipment case. TVO Powermate Photos gallery on flickr.com. Read why Powermates “go beyond” the Barlow on our website (mobile version).